Cee Payne is NZNO’s industrial services manager. 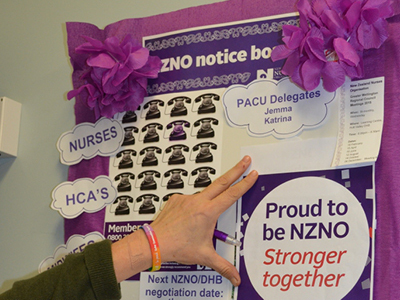 With decades working as a nurse and for NZNO she has lived and breathed untold campaigns. 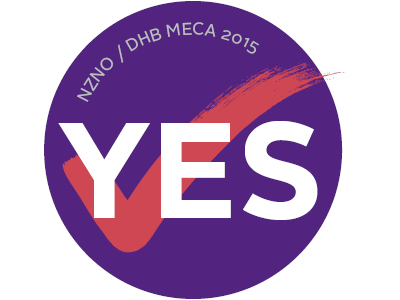 She talks here about why our recent DHB MECA campaign was so awesome. 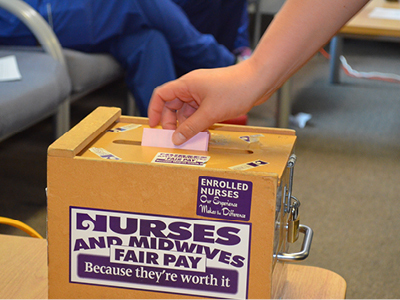 On Monday, NZNO members working in DHBs started working under a new and improved multi-employer collective agreement (MECA). The deal was ratified by over 75% of voters. That is a solid achievement! There were highs and lows in our campaign. There were many months of bargaining, activism, an unacceptable offer, mediation and now this. 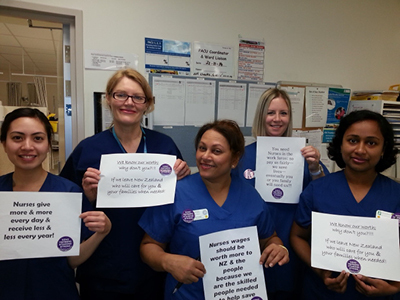 We could not have achieved a 2% + 2% pay rise in this environment without your commitment. We should be proud that we managed to get a deal, despite the underfunding of the sector over the last seven years. Our achievement will filter through to other parts of the health sector too. We have set a precedent. Many other health workers will reap the benefit of our hard fought settlement. Perhaps one of our greatest successes is that we secured this deal with all existing conditions intact. Your understanding of the new environment created by the Employment Relations Act has been important. Thank you for your commitment to collective bargaining. 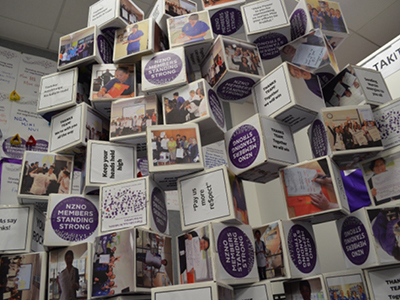 Your thousands of signatures on hundreds of letters to DHB chief executives, your photos, collages, your ‘purple passion’, and standing strong together is what pushed us over the line. Thank you for all your messages of support and solidarity. There were times when bargaining was tough, but you really made the difference for our team. I’ve loved seeing NZNO members claim our colour proudly! 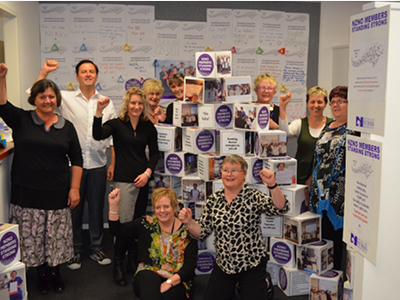 Thank you too, to the NZNO staff who organised and rolled out the campaign. You have my sincere appreciation for your effort and hard work. We celebrated 10 years of our MECA at the start of this year, and I look forward to 10 more. 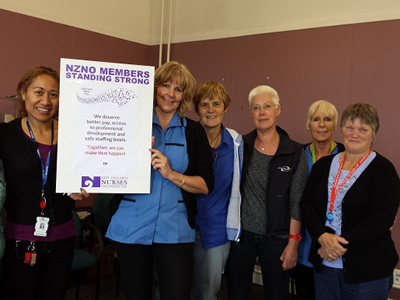 I am with you in solidarity; standing together and proud to be NZNO! 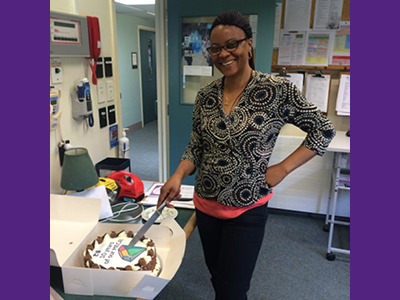 An NZNO midwife cuts the cake at Kenepuru’ Hospital’s 10th MECA bash. Auē! We mourn the passing of our Aunty Putiputi. Putiputi O’Brien, Ngāti Awa, Te Arawa and Tūhoe graduated from the Waikato Hospital School of Nursing in 1945 and worked in hospitals in Rotorua until she became a public health nurse in 1948. In 1981 she went to work for Midlands Health as a district community health coordinator and managed the Ngāti Awa ki Rangitaiki health initiative. Putiputi O’Brien was awarded a Queen’s Service Order for services to nursing and her community in 1987. In 2002 Te Rūnanga o Aoteroa, NZNO were proud to present the Akenehi Hei award to Whaea O’Brien for her services to Māori and nursing. 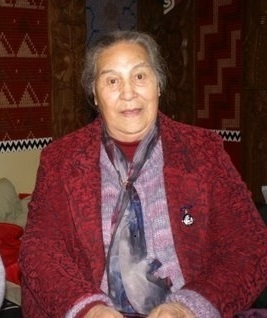 Putiputi O’Brien said of her work in rural Te Teko, where the only mode of travel was by horseback, “In those areas you were a jack of all trades, as you were the nurse, the doctor and a midwife”. We pay tribute to Putiputi O’Brien and honour her outstanding Māori leadership. Whaea Putiputi has worked tirelessly to improve the health and wellbeing of our people. As a recipient of our most prestigious award Putiputi was acknowledged and admired by her peers for maintaining the integrity and values of manaakitanga, kaitiakitanga and wairuatanga as she went about fulfilling her vision of building a strong and resilient Maori workforce, in what were challenging times. There is a Māori proverb that goes “Kua hinga te totara i te wao nui a Tane. The totara has fallen in the forest of Tane”. Although we have lost a mighty totara and wahine toa, we take comfort from her vision that has inspired many – young and old, Māori and non-Māori. There are many who follow in her footsteps and who will ensure her dream continues, they will grow into the new Māori leaders and Whaea Putiputi O’Brien will remain in our hearts. Tags: Maori health, Putiputi O'Brien, Te Runanga NZNO, tribute | Permalink. Debbie Papera is an NZNO staff member who works in the Wellington Regional Office. 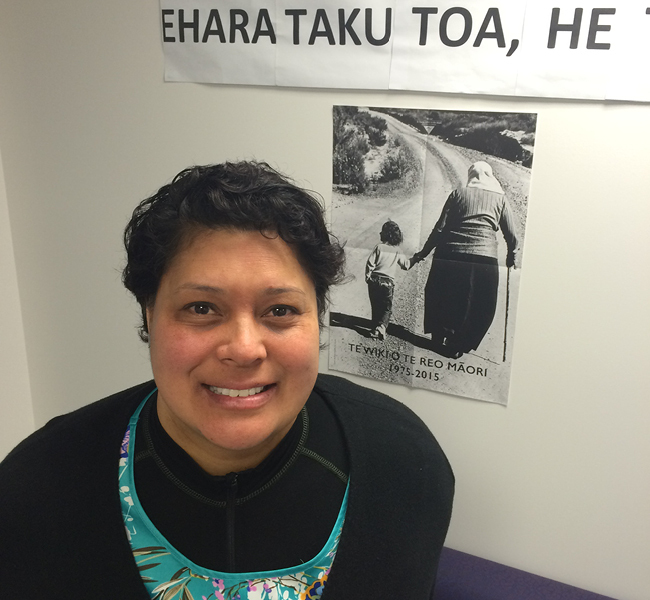 She is involved in the Māori staff group Te Whakaruruhau and is on Te Ara Reo Māori at Te Wānanga o Aotearoa. Debbie is a supporter of NZNO’s bi-cultural model and walks the talk of tikanga in her work every day. On Friday and Saturday last week I attended the NZNO and Te Rūnanaga o Aotearoa, NZNO Indigenous Nurses Conference in Tāmaki Makaurau. It was amazing, truly amazing. How can I explain? For me it was like my korowai hugging me; with each feather symbolising my tipuna and every single person present at the hui. I feel quite emotional about the experience, still. There aren’t many times I can really connect like that with my people. It’s the best two days I have had in a long time. I was lucky to be able to attend as an NZNO Māori staff member and to catch up with two of my colleagues at the hui too, from Rotorua and Tauranga. Kia ora sisters! Thank you for going on this journey with me. There were over 300 Māori health workers at the conference and I noticed that many young nurses, students and new grads found the whanaungatanga really beneficial, in terms of building relationships with other nurses and their connection to NZNO and Te Rūnanga. There were wonderful speakers. A couple of presentations that really moved me were by Dr Misty Wilkie-Condif, and Janine Mohamed and Dr Roianne West. Dr Misty Wilkie-Condif is an American Indian of the Turtle Mountain Band of Chippewa Indians. She talked about how similar American Indian practices are to Maori tikanga, for example both Maori and American Indians place great importance on leaving this earth with our full physical bodies in place. One way that is encouraged to happen in the American Indian communities where Dr Misty works is led by midwives. 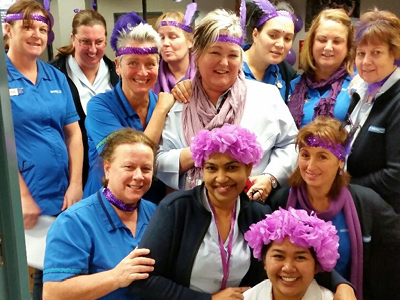 Community midwives go out and all around the villages talking to hapū wahine and new mamas. When pēpe is born part of the midwives job is to make sure the whenua is wrapped and ready to go home with the mamas for burial. This deep connection between our culture and the American Indian culture is special. The other presentation that has stayed with me was by our sisters from across the ditch. Janine Mohamed is a Narrunga Kaurna woman from South Australia and Roianne West was born and raised Kalkadoon on her mother’s country in North-West Queensland. They were representing an organisation that travels out through the outback encouraging young people to become nurses. They say they need the new generation to be educated as nurses so they can look after the elders who are suffering from diabetes and other diseases relating to their poverty and colonisation. It’s a kaupapa based on whanau and community. For me the hui left me with a feeling of positive-ness. As Māori we have had a hard road culturally and because of colonisation. It was wonderful to see so much work happening to fix the structural discriminations and improve the health of my people. My message to our rūnanga throughout NZNO is: stay true to your tikanga and never forget that your tipuna are always with you and have your back. Tags: Bi-cultural model, hui a tau, Indigenous Nurses Conference, NZNO, Te Runanga NZNO | Permalink. Mask up or ship out?! The issue of vaccinations and the flu vaccination in particular has been on our agenda over the past few months, as it has been for the sector. In 2015, despite improved uptake of the flu vaccination amongst DHB employees, one DHB (Waikato) has still taken a punitive approach to non vaccinated staff, insisting they wear masks when in direct patient contact or risk suspension and disciplinary procedures. We felt at this time it might be appropriate to discuss the role of NZNO in this matter. Amongst our membership we have the full spectrum from those passionately in favor of vaccinations, to those equally against. So should the union even have a view and if so on what basis? So starting with the right not to be vaccinated – we all have that right. Being injected against our will is assault, pure and simple. 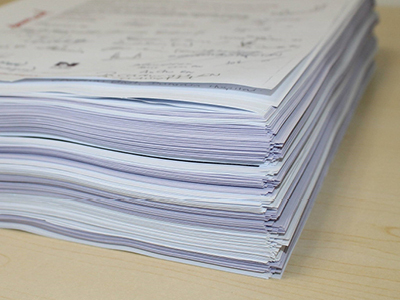 In addition, when in receipt of healthcare, everyone is covered by the HDC Code of (patient) Rights. This provides for the right to informed consent and the right to say “no”. It also provides for the right to be treated with respect. Given one role of NZNO is the legal protection of member’s rights, enforcing the right not to be vaccinated goes without question. The issue of vaccination largely comes down to an individual view (I do or do not wish to be vaccinated because I…) or a collective one. On the latter, there is both a public health good derived from vaccinations and an employment one. The former relates to the reduced spread of disease and therefore harm, especially amongst those in our communities who are most vulnerable, and the latter, lack of staff to treat the sick due to staff themselves being sick. And yes for the DHBs fewer sick days and so less cost, is attractive. Evidence confirms that whilst not a perfect remedy, vaccination is the best mechanism we have to prevent the spread of disease and the human toll that disease represents. Herd immunity, where vaccination rates are high enough to stem the spread of disease and therefore protect a community, is the goal. The flu vaccine is not 100% effective. Each year the vaccine must be reconstituted to capture the new strains of flu that emerge. The flu virus is a nasty little beast that genetically morphs from year to year, hence its success as an organism! As impressive as this may be, lets not forget, it also kills. Regardless of your view on vaccination, this virus is not the common cold we can all expect to suffer most years. It is a serious and life threatening virus that has caused millions to die. When the unions and DHBs (in the forum known as NBAG) collectively came together to investigate the issue what became clear was that a positive, educative and supportive approach to the issue of vaccinations was far more successful than punitive, threatening or negative. If the overall motivation is community good through protection from disease, having people “on board” is going to more effective than the resistance a negative approach inevitably engenders. This is not so much about vaccinations per se, but about how we approach the issue. Acknowledging that employees can’t be required to be vaccinated, what about the DHBs ability to decide what to do with the non vaccinated staff? In fairness NBAG didn’t even go there (at that time). 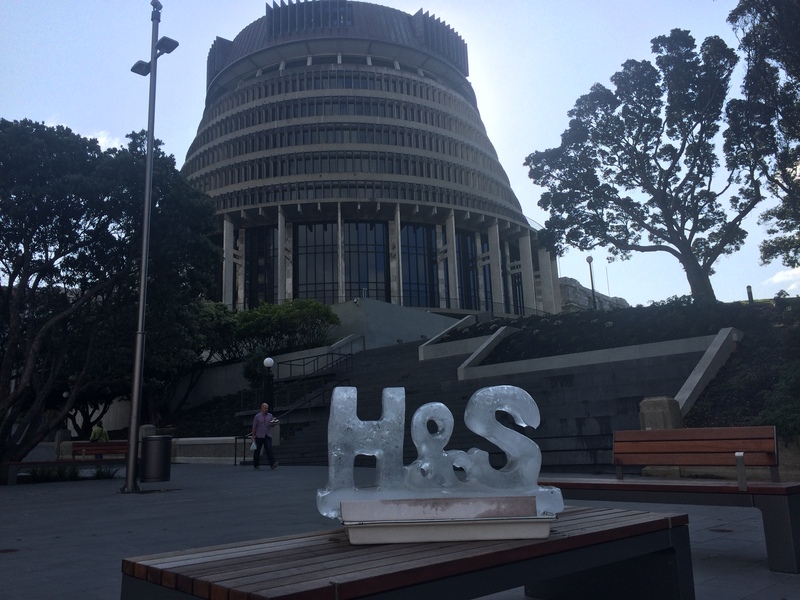 We agreed a positive and constructive approach was better and looked (amongst other things) to whether the unions had a role in leadership on this issue, thereby in effect avoiding a negative reaction that some DHBs might have in the face of non vaccination. The answer was yes: better to keep members out of trouble whilst recognising everyone has rights. NBAG put out guidelines to the DHBs supporting a positive and educative approach, rather than punitive. And the unions agreed to support engagement with members on this issue. So far so good. 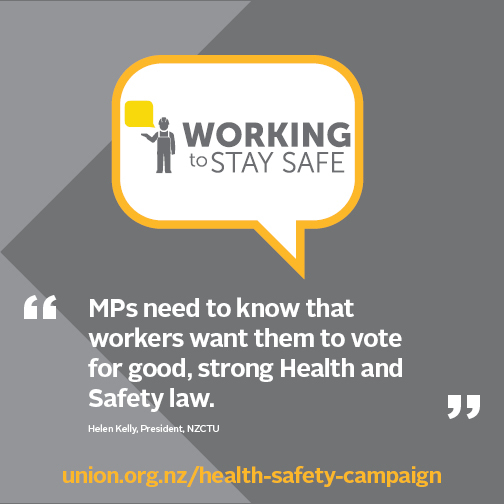 Unions avoided the punitive and inevitably adversarial approach DHBs might take against members: DHBs got our support on the vaccination process. Interestingly, for all the concerns expressed by the DHBs, the uptake of vaccination by management was no different from the rest of the staff, confirming that we are dealing with a wider and more intrinsic issue than superficial review might suggest. So why did Waikato DHB ignore NBAG advice and fail to engage with us on the issue? Well Waikato DHB has an already evidenced poor culture when it comes to employee engagement, so probably no surprises there. It is sad, but this DHB continues to have a poor attitude towards their own employees on a number of fronts, including bullying. And again, regardless of their personal views about vaccination, members have been almost universally concerned at how Waikato DHB is handling this matter. What is “direct patient contact”? 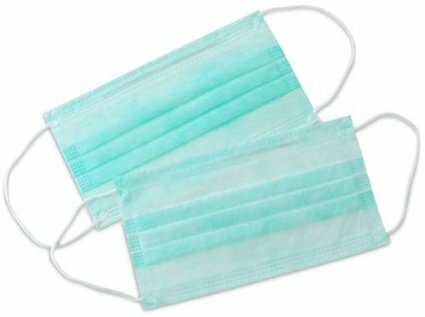 How effective is mask wearing, including how often we need to change masks to be effective? What of the effect on patient – staff communication through a mask? Distribution of personal health information (vaccination status is health information). What of patient and visitor vaccination status? Visitors can equally spread the virus (remembering the flu is communicable up to 14 days prior to symptoms emerging) so what is the point of just concentrating on staff? If the patient is vaccinated, should the staff member have to wear a mask? If such a public health issue, consistent application of measures are surely required? If that means short staffed areas being left without staff and services interrupted as a result, what is the balance between non vaccinated staff on duty and no service? We could go on…. 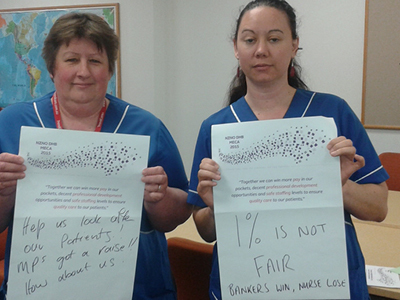 Waikato DHB’s approach is also causing resistance amongst staff, and could be self defeating. It is also exacerbating a prevalent negative culture in this DHB which is corrosive, damaging to staff and in need of change all issues of concern to us and our members. So in summary: Why are we involved? Because members have rights and we are tasked legally with preserving those rights. Because we also have a role to play in avoiding conflict and progressing matters on an evidence based and reasonable basis. Because Union leadership is evidenced as being instrumental in assisting with positive change on issues such as this (and our own experience supports this). 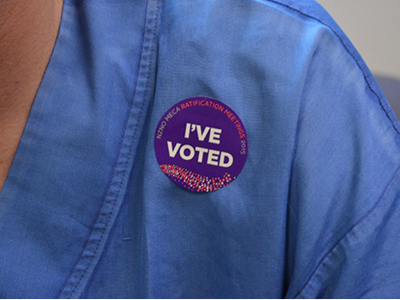 Because at the end of the day our members want what is in the interests of not just themselves but their patients and communities. However as with most things in health, this is a more complex issue than a superficial glance might suggest, and we need to do the best we can to get it right. Tags: discrimination, flu vaccination, public health, workers rights | Permalink.